Life After 'Life': Aging Inmates Struggle For Redemption A Colorado program for long-term offenders helps a group of aging ex-cons as they attempt to make their way in a fast-paced world and rejoin a society that is not sure they deserve that chance. 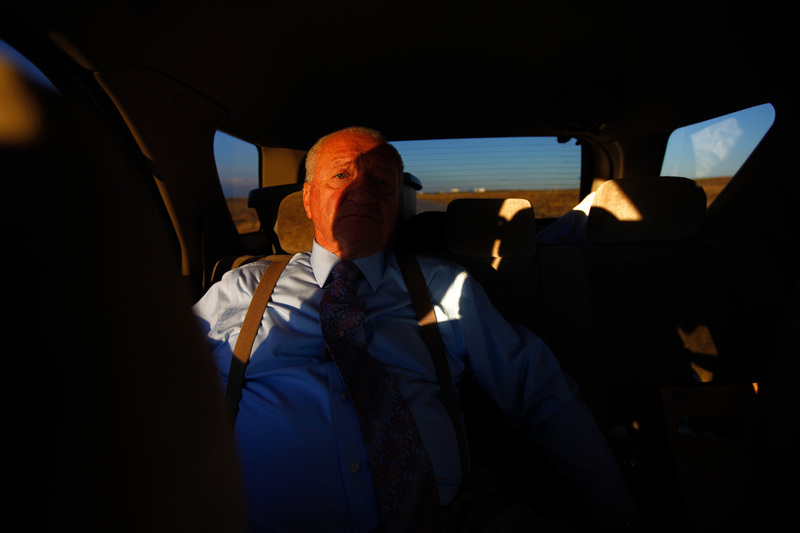 John Huckleberry sits in the back seat of a friend's car on the way back from visiting inmates at Sterling Correctional Facility. 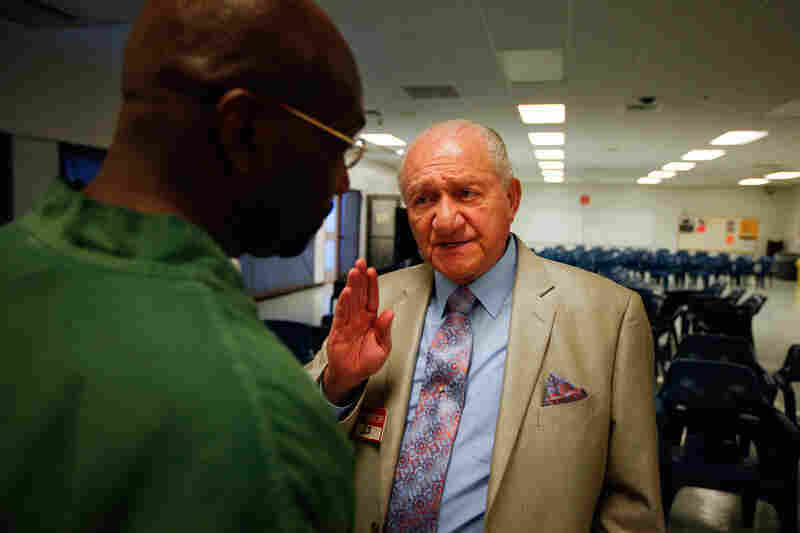 After 30 years in prison, Huckleberry — who was released in 2012 — helps aging inmates prepare for life outside prison. Out in the empty plains of northeast Colorado two years ago, nine inmates line up against a wall inside the Sterling Correctional Facility. It's a line of green jumpsuits and gray hair. The men, hobbling on canes, wait for the others to pull plastic chairs into a circle so class can begin. Today's instruction is about what life is like on the outside: how to use an ATM, how to find a job, what the Internet is. These men have been in prison for two, three or four decades. These are things none of them know. There are more men like them growing old in the nation's prisons than at any time in U.S. history. It's the result of longer sentences and the elimination of parole. And the price tag is showing. It costs taxpayers $16 billion a year to house aging inmates, with their health care and special needs. And experts say that by 2030, the number of aging prisoners will grow into the hundreds of thousands. States are facing costs in the billions. Any state that releases 14 or so of these inmates saves $1 million a year. So Colorado is putting inmates through a kind of school, called the Long Term Offender Program, to teach them what life is like on the outside. All of them have been carefully selected — men with excellent prison records and a likely chance of parole. Tim Hand created the program when he was division director of Colorado's Department of Corrections. He starts off the meeting simply: "What can we do to help you," he says. This program hopes to teach these men how to navigate a fast-paced world; how to rejoin a society that isn't sure they deserve the chance. What it can't do is help them face themselves. These men will go to counseling and take classes, gain perspective on their crimes and help each other, and in some cases, get paroled to freedom. But for many of them, that freedom may be easier to come by than redemption. At the meeting, each man introduces himself, rattling off ages in the 60s, 70s, 80s. John Huckleberry is one of them. "I've been locked up 29 years and two years prior to that in county," he says during an LTOP meeting at the prison. Huckleberry has gray hair, a round belly and walks with a cane. He is about 70 years old, give or take because he was born while his mother emigrated from Sicily and he doesn't have a birth certificate. Huckleberry, like the rest of the men here, was sent to prison in the 1970s and '80s, when a life sentence still came with parole. Back in those days, men were released after 10 or 20 years. Hand tells them that made acclimating to society less difficult. "Historically we just kind of handed you your hundred bucks and said good luck and make it work and don't recidivate," Hand tells the group. The men nod. One inmate, Lefty Gomez, offers to fill in the rest of the story. "One guy when I was [at another prison] said he has been 35 years in prison without ever seeing the streets," Gomez says. "When he went out there, he said it was so different, so fast-paced he couldn't take it. Most of his family were gone. So he said he went and got a gun and went to a liquor store and said I'm not here to rob you, but I want you to call police and they sent him back to prison." Hand smiles a little. He remembers that guy. When he was running parole, he was averaging five or six stories like this a year. He's hoping this group of inmates will do better. After the meeting, all the men linger. Huckleberry says he's been in prison so long, he'll probably die here. He says it flatly, as though it is a fact he just knows to be true. But he and all of the men here are clinging to a little piece of hope: that they might one day make it to the other half of this prison program — the part on the outside. At the Dahlia halfway house in Denver, men in jeans and T-shirts are standing around an old barbecue grilling hot dogs. This is where Hand sends the men after they are paroled from prison. Most will spend about six months here. Once a week they get together to grill, eat and talk. It's like a support group. You won't see this kind of gathering anywhere else. Parolees are usually prohibited from associating with other ex-cons. But in LTOP, it's required. At the Dahlia halfway house, residents meet to learn skills about what life is like outside prison. Chris Mayes, a onetime bank robber, is trying to explain the details of a bank account he set up for the group. But a former inmate named Greg Wells can't resist jumping in. "I want to ask you a question about that though, Chris," he says, trying not to smile. "When you went in to set up that account for LTOP — I know how it felt for me when I went in to set up my accounts and stuff ... but did it feel different [for you] going in and doing that instead of robbing them?" The room erupts into laughter. In moments like this it's hard to imagine that these guys with their jokes, gray hair, canes and years of good behavior are still a threat to anybody. But they didn't spend decades in prison because they are still a threat; it's because most of these men around this table have killed someone. Talking about it at these meetings is supposed to remind them that just as the world changed, hopefully, so have they. "A lot of guys don't have a true understanding of what we have done to our victims," says Wells, who spent 36 years in prison for being an accomplice to the murder of two people during a robbery. "I would ask guys [in prison], 'Well, what are you doing time for?' They say, 'Well, I'm doing time for first-degree murder.' OK. 'Who's your victim?' One guy [told me], 'All my victims are dead.' "
Wells continues: "Well, it goes way beyond that. It goes to their families. It goes to your family. ... It goes to the people of the state of Colorado. It goes everywhere. You have to [have] empathy. It's just a must. And in the penitentiary that's a weakness." In the early 1970s, a life sentence in Colorado, like most of the country, actually meant 10 years with parole. But in 1976, crime was rising. Colorado lawmakers responded. A life sentence became 20 years with parole. In 1985 it became 40 years with parole. Then in 1990, Colorado followed the majority of states nationwide: Life became the rest of your natural life, no parole. In years to come, no one sentenced for the crimes at this table is likely to be released. 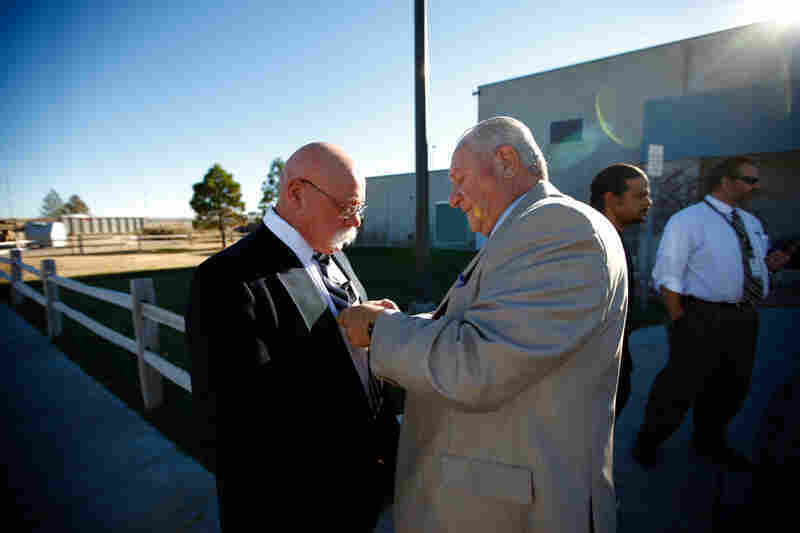 John Huckleberry (right) helps Ronald Boley tie his tie outside the Sterling Correctional Facility in Colorado. About once a month, the men — along with a group of other former inmates living in the Denver area — drive the two hours to Sterling to meet with members of the Long Term Offender Program, who are still behind bars but hoping to make their way out. On the way to the meeting, prison guard Sgt. Pamela Bornhoft greets Boley, a former inmate at the facility. While he was still incarcerated, she had encouraged him to enter the program that's designed to help those aging in prison adapt to the outside world upon their release. 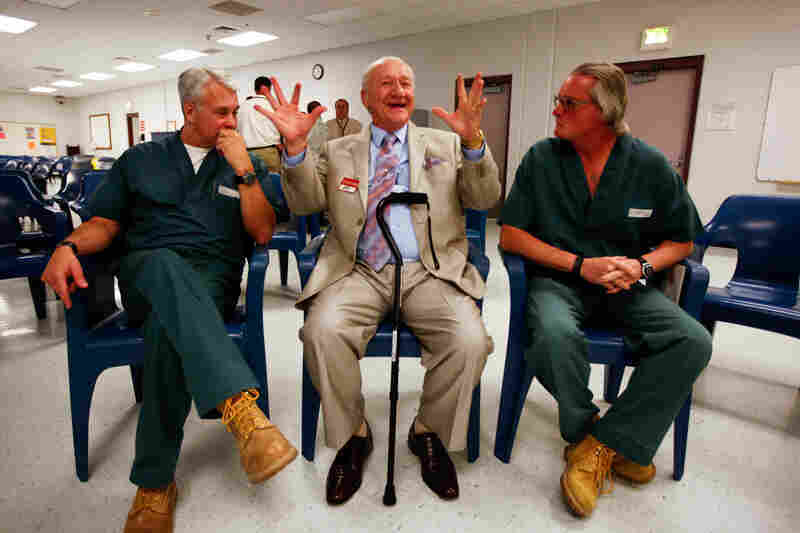 Huckleberry jokes with inmates Herbert "Michael" Marant (left) and Richard Schauerman (right). Dapperly dressed and now married with a house, Huckleberry is a beacon of hope to the men inside. 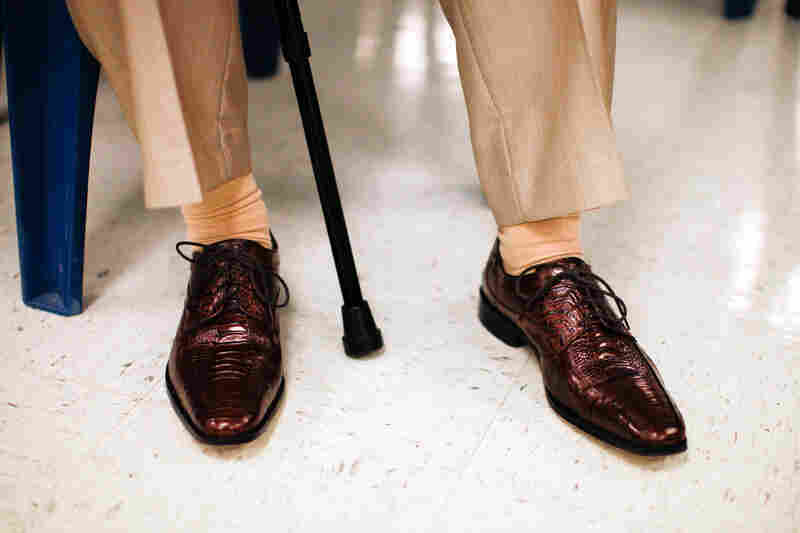 Huckleberry has amassed a snappy wardrobe, mostly from thrift stores — a sharp contrast to the shapeless green suits he wore for 30 years in prison. Huckleberry gives a stern lecture to inmate Darren Smith. One mistake once they're out, and they most likely will be sent back to Sterling for life. Greg Wells talks to the group about life outside prison. The message: It's not easy. The men exchange emotional coping strategies as well as practical tips on friendly employers and city services. 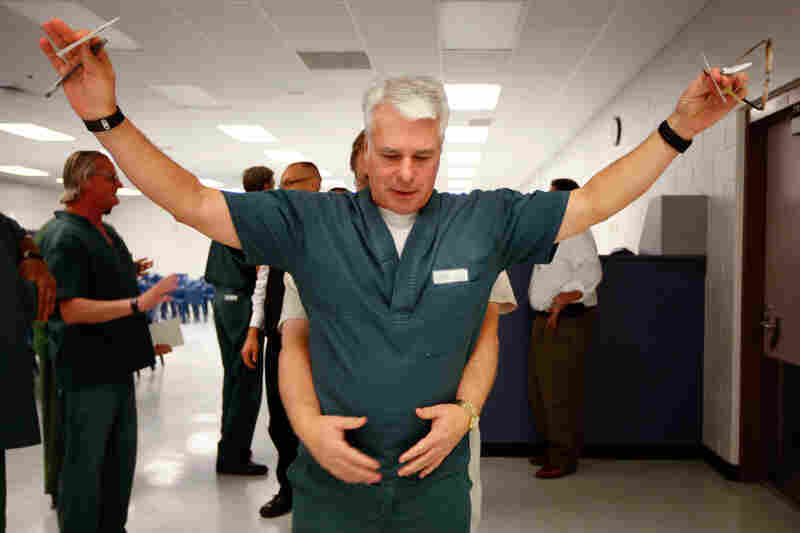 Inmate Christopher Penley hugs Wells goodbye at the end of the session. Marant is frisked before leaving the meeting room along with all the other inmates, a reminder of the world they are about to re-enter and of the huge distance between those on the inside and outside. 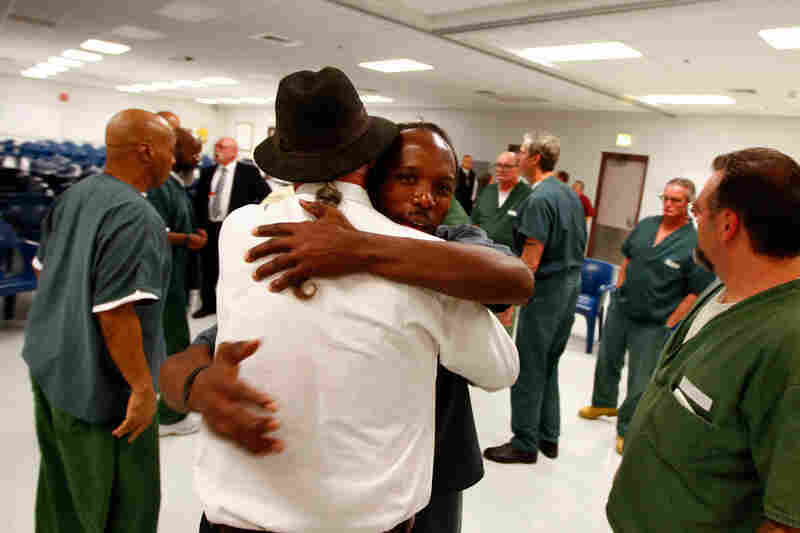 Most of the men here spent about three decades in prison, three decades in the same room. But there's no self-pity here, mostly because of Red Thorpe, a former inmate. "It's hard for us to talk about it out loud," Thorpe says. "Somewhere along the line, we feel sorry for what we've done." Thorpe's the leader. This program was modeled after him. After 25 years in prison, he went from motel handyman to college instructor and managed to do it largely on his own. Now he mentors everyone who comes through the Dahlia halfway house. "We feel bad because of the pain and suffering we've inflicted upon others," he tells the group during one of their meetings. "Until you come to grips with that, the rest of you is a facade." Many of these men have known each other for decades, and they know many of the men still behind bars. Wells says when he was released after 36 years, it was hard to leave all the people he was close to behind and enter a world where he barely knew anyone. Wells and Huckleberry were particularly close. He remembers when Huckleberry came to prison a first-time offender at 40 years old for killing his wife. "That's my boy," Wells says one night after a meeting. "When he first [came] to prison, I had already been in for a while, and myself and a couple of other guys kind of just took him up under our wing. It just became like a family." Hand says LTOP wasn't designed to help Wells, Huckleberry or any of the other men get out of prison. 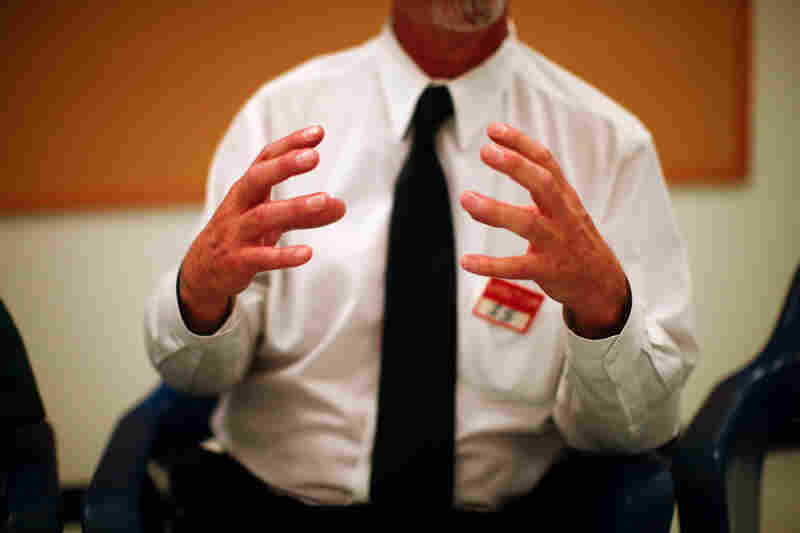 "I'm not advocating for people to be released," Hand says one day in his office at the parole division headquarters. "What I'm doing is looking at a reality ... that they are getting released. Shame on us — shame on us for seeing people in our prison system that are eventually getting released and giving them nothing, nothing to prepare them for it." 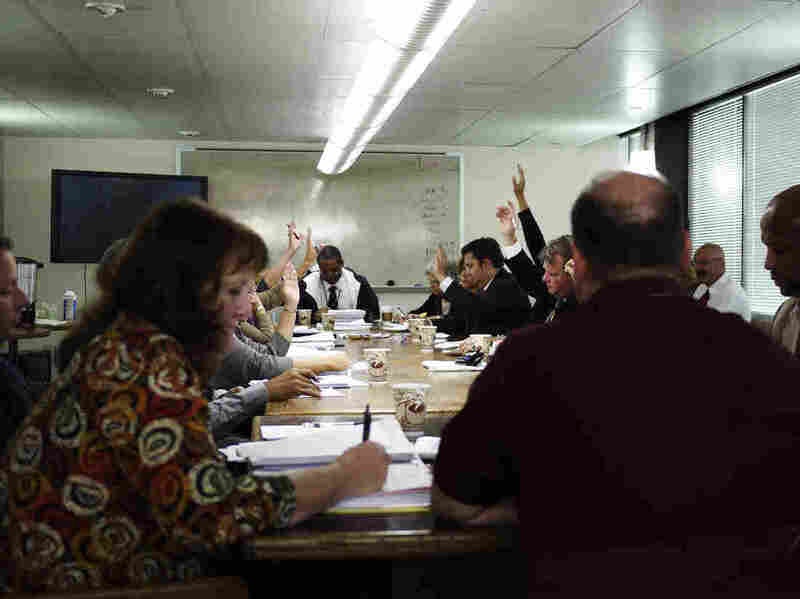 In the fall of 2012, a meeting for a program called community corrections — which is similar to parole — gets underway at 7:30 a.m. in a downtown Denver office building. Several of the inmates from the LTOP program are up for consideration. More than a dozen community leaders and officials sit around a table piled high with papers. Inmates don't come, but victims' families are welcome. None have shown up. These officials have already read through the paperwork. This is just a show of hands as 50 or so inmates' names are read from a list. Two LTOP members are passed over. Then the man at the head of the table says: "OK, then we have John Huckleberry with the LTOP program. All in favor?" A lot of hands shoot up. During this community corrections hearing in Denver, John Huckleberry is approved for parole. "Accepted," he says and moves on to the next name. And just like that, for Huckleberry, 30 years in prison are behind him. A few hours later, Wesley Wilson, a Sterling prison supervising case manager, steps into Huckleberry's cell. Huckleberry's not even blinking. Wilson gives him the official news. "It's just so overwhelming," he says through tears, grabbing onto his bunk. He sits on his bed awhile, trying to catch his breath. After a few minutes, he starts to look around under his bed and pulls out a small photo album. He points to a picture of a smiling woman. "That's Beverly right there," he says. "That's our wedding." Huckleberry killed Beverly, his wife, three days after Thanksgiving in 1983. They were fighting. They didn't have any children. "I was in a truck and she was standing on the curb," he says. "And I do remember looking behind you know in the truck. But instead of the truck racing backwards, it bolted forward. It hit the curb, hit her, knocked her down and came down on top of her." Asked if he's saying it was an accident, he pauses. "No, I'm not saying that," he says. "The split second that it happened I wanted to hit her. And I wanted to hurt her. And I even think I thought about it. And that's why I've never ... that's why I always thought, you know, I deserved to come to prison. You can't do something like that and not know that you deserved to be punished. To be real honest about it, you know, she was a good person." John Huckleberry in his prison cell after learning he's been paroled. Huckleberry's cell is tidy. But what he owns doesn't make a whole lot of sense. He has sweatpants that he's never worn. Handball gloves he's never used. A legal box with nothing in it. "I have the box because I can have it," he explains. "You see that coffee maker up there? I don't drink coffee. I have it because I can have it, OK?" This room is his whole world. "The things that you can have become very important and personal to you," he says. In a couple weeks, his world is about to get a lot bigger than sweatpants and empty boxes. He got married over the phone years ago to a woman he corresponded with. But he hasn't seen her in three years. He's going to need to find a job, learn how to take the bus and pay rent at the halfway house. "I have no fear at all," Huckleberry says. "No anxiety whatsoever. Just elation that I'm going." Two weeks later, Huckleberry takes all his handball gloves, sweatpants and coffee makers and wheels them across the prison to have them shipped home. The next morning a bus carrying Huckleberry from the prison pulls into a local jail. Huckleberry steps out looking pale white and climbs into a van to take him to the halfway house. His hands are shaking. He hasn't seen downtown Denver in 30 years. "It's really hard to take in right now," he says, holding the back of the seat to keep his hand from trembling. 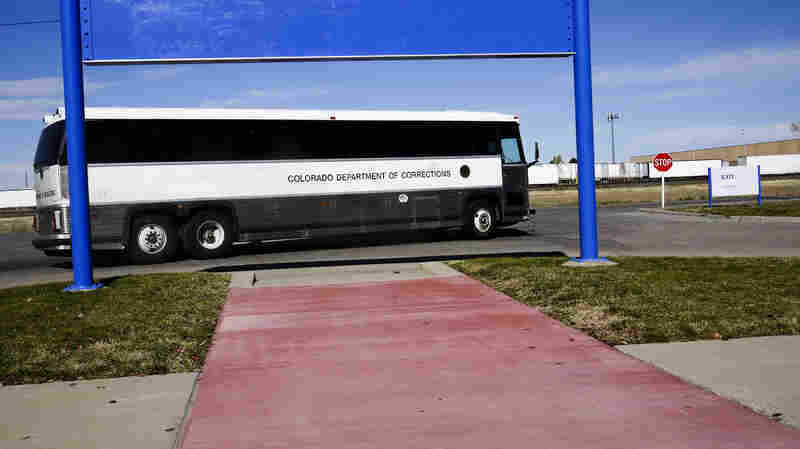 The Colorado Department of Corrections bus carrying John Huckleberry from prison to a local jail where he will be released. The van pulls to a stop outside the Dahlia halfway house. When Huckleberry goes to step out of the van he almost collapses. "Oh, my legs are shaking," he says. He steps inside the rundown building, but stops in the entryway. "This door here?" he asks twice. People are walking right past him. But Huckleberry isn't moving. He's waiting. For three decades he's waited for someone to tell him to step into a room. Finally, someone comes out of the office — and asks him why he's standing there. After an hour of paperwork, he sees a friendly face. Former inmates Jo Jo Nicholson and Red Banks greet him with cheers. "Hi, Grandpa," they call out. They take him into a room where other members of LTOP are waiting. This is the idea of the program: keep him close to people he knows from prison, rather than dropping him off at a bus stop and telling him to report to his parole officer in a week. Nicholson pulls out something Huckleberry has never seen — a cellphone. He holds it up and starts taking Huckleberry's picture. "What did you do now?" Huckleberry asks, confused by the clicking noise the phone is making. Nicholson says he's taking his photo. Jo Jo Nicholson was John Huckleberry's cellmate. One of the younger members of LTOP, he spent 22 years behind bars. "You took a picture?" Huckleberry says. Nicholson says he's going to take some more later but needs to put his phone on the charger. "On a what?" Huckleberry asks. "On a charger?" Nicholson ignores him and holds up his phone displaying the picture he just took of Huckleberry. "Oh, crap!" Huckleberry says stunned. "You just took that picture and it's already there? Come on. No kidding. You took that picture and it's there?" By the evening, Huckleberry looks exhausted. His old prison buddy, Wells, is by his side. At one point, when Huckleberry is confused by the details of checking in at the halfway house, his lip starts to quiver. Wells puts his arm around him and asks if he's all right. It's exactly what Hand had in mind when he implemented the program several years ago. The program is now run by Eric Holzwarth, an assistant director in the Colorado Department of Corrections parole division. "I always tell the men I will not advocate for any one individual," Holzwarth says. "But I will advocate for the program." The men on the outside have a counselor they can talk to, a designated parole officer and the support of staffers at the halfway house. 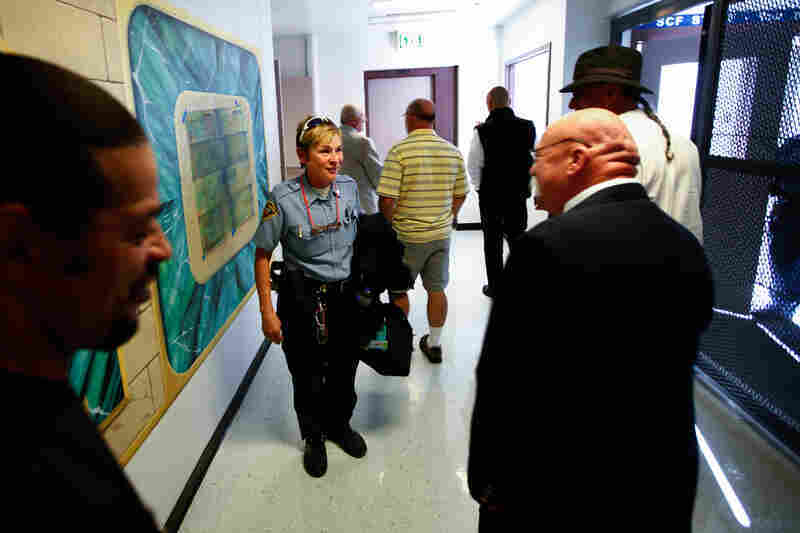 But Holzwarth and Hand both say the program works because the inmates themselves advocate for each other -– helping each other find jobs, apartments, and make it through life struggles, like connecting with family members they may not have seen in decades. 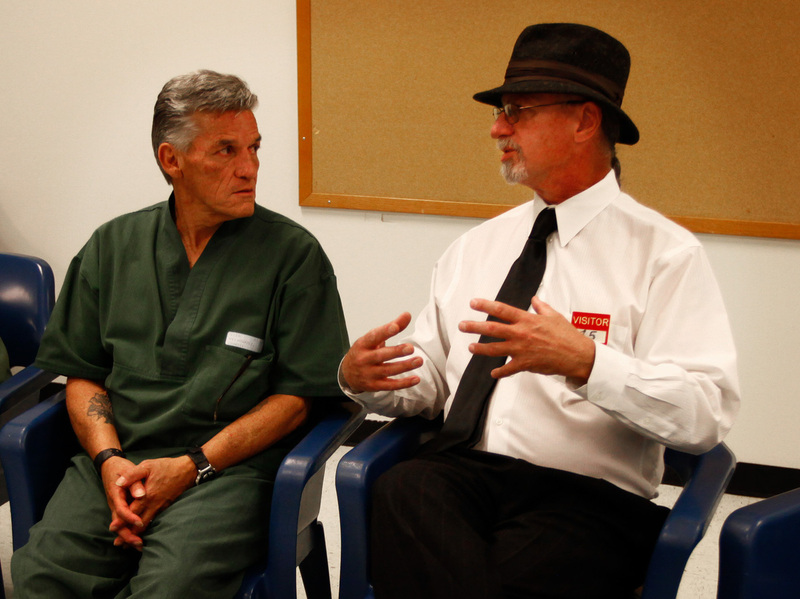 Greg Wells (right) talks to fellow member of the Long Term Offenders Program during a group support meeting at Sterling Prison. They and other officials point to one former inmate in particular: Red Thorpe. Officials say this program would not exist if it weren't for him. He is the group's original member and mentor, and the model the program was designed around. Officials say Thorpe has made this program work because he knows how to talk and explain things to the former inmates. All 32 of the men who participated in LTOP have found jobs and places to live. Except for a minor shoplifting ticket two years ago, not a single one of these men has committed a crime. Thorpe recently earned his Ph.D. He spends his days teaching young adults who are struggling. In recent years, he has helped more than 400 of them get their GEDs. He's raised his wife's children as his own into successful young adults who call him Dad. But like everyone else in the program, Thorpe has a past. And it will change the way you see him. In 1979, when he was 22, Thorpe and a friend picked up a 16-year-old boy hitchhiking home from a concert. They decided to hold him for ransom from the boy's parents. It didn't work out. Thorpe took the boy to a lake, tied bricks to his feet and threw him in -– except the boy managed to swim. When the boy got to the shore, Thorpe strangled him to death. Thorpe pleaded guilty. Today he would have been sentenced to death or life without parole. In 1979, he got 20 years with parole. All these men know Thorpe's crime, and about all of each other's crimes. There's little tolerance in the group for men who don't own their crimes before they are released — and after. It's the fall of 2013, a year after Huckleberry was released from prison, and a lot has changed for him. He moved out of the halfway house and into a rundown apartment complex. He reconnected with Esther, the woman he married over the phone in prison, and she has since moved in with him. 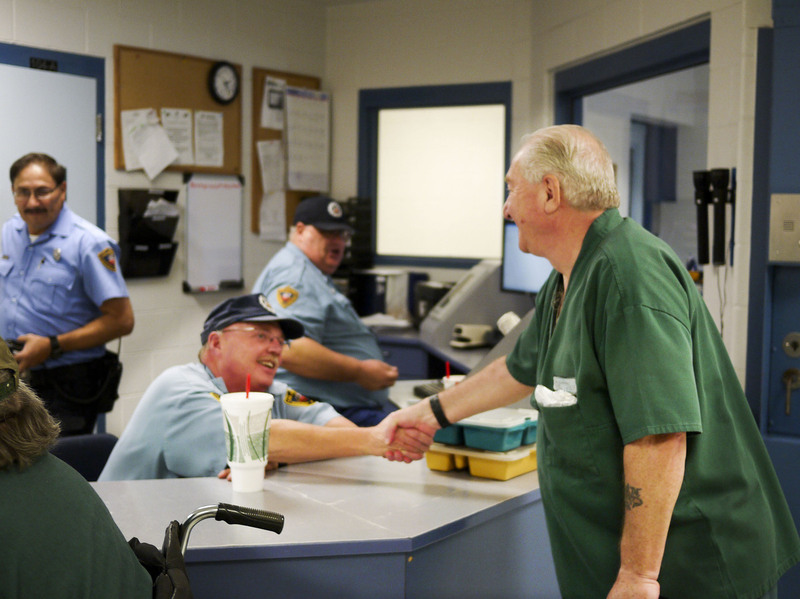 John Huckleberry says goodbye to prison officers. Inside, the apartment is a cozy space with light music playing from the radio. Esther serves tea in flowered cups. They've covered the stains on the carpet with area rugs. Since he's been out, Huckleberry has found a couple of jobs, including one at a car dealership. But they fired him when they found out he's a felon. Huckleberry walks excitedly to the bedroom and pulls open the closet. "You ain't going to believe this," he says, opening the doors to a row of suits. "This is a Joseph A. Banks suit. I paid $9.90 for this suit. Everything came from Goodwill." On the top shelf are the sweatpants he so carefully mailed back from prison. He seems to have forgotten all about them. Huckleberry has followed all the rules of this program. He used to cost taxpayers almost $70,000 a year in prison, according to national statistics. Now he's been paying taxes from odd jobs. "It's a leap of faith. I hope he's sorry or I hope when he gets out he does the right thing. [But] you don't know if he's going to. You don't know if I'm going to or not. I don't know, [with] these guys coming out, I don't know. And I've known them, right?" 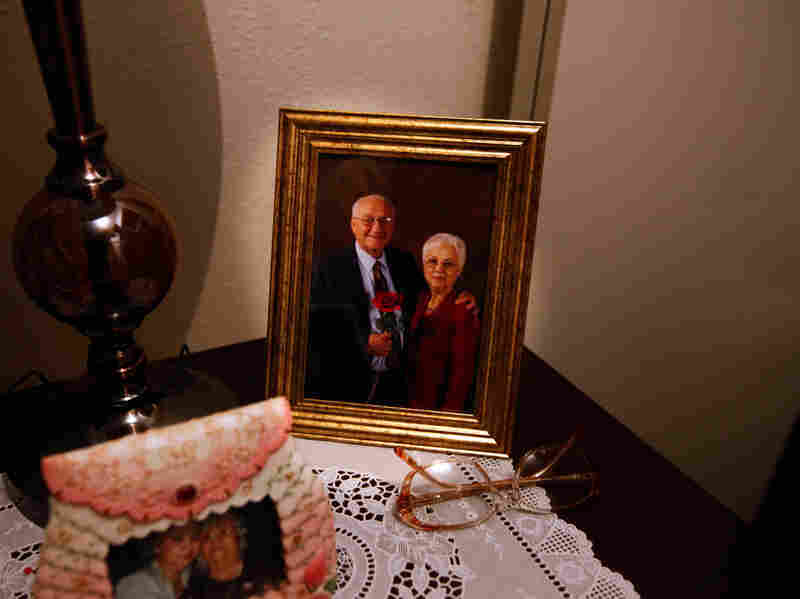 A photograph of John Huckleberry and his wife, whom he met while still in prison, adorns a table in the couple's home. Huckleberry says Thorpe is a good example. "A crime that was real heavy," he says. "But look at what he's done [since then]. Don't you have to separate it? Don't you have to separate the man who did the deed years and years ago and the man that he's become? Don't you wonder? Don't you say, 'Wow, how did he get here from there?' "
Huckleberry pauses for a moment. He says he knows the question is not about whether someone can change, but should he be given the opportunity to. He says when people hear about Thorpe's crime now, it sounds like it happened yesterday. "And why is he out?" Huckleberry says, mimicking what he says people will say. "Why does he have that job? Why does he deserve that job? He just did that to a child! The average person can't separate that it was 40 years ago," Huckleberry says. Thorpe lives about 20 minutes away from Huckleberry in his own modest apartment complex. He's been out of prison almost 10 years now. As he opens the door, his apartment is just as tidy as Huckleberry's. But with many more pictures. He's married now, and his refrigerator is covered in pictures of the children he has raised as his own since they were little. Thorpe's own childhood in Alaska was rough, but he is afraid to tell people about it because he's afraid it will sound like he's making an excuse. He ran away from home at 16. Spent a year in a group home for boys and joined the U.S. Marines at 17. By 20 he had left the service and spent his days drinking and doing drugs. "I was an out of control idiot," he says, sitting in a big chair in his living room. "I had no regard for anyone, their feelings, nothing." Thorpe talks quietly. He often seems almost shy. His friends say he comes to life in front of the underprivileged young adults he teaches. He works with them long after the school closes and takes their calls when they need someone. When he strangled William Leonard, Thorpe was 22 years old. When he went to prison, he was a warden's worst nightmare: He was angry, violent, and he says he did not care if he lived or died. 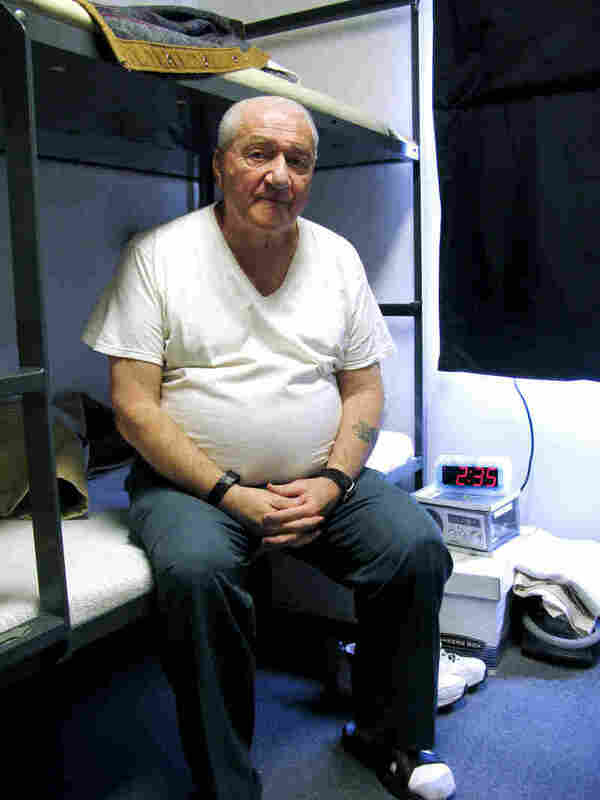 But then, Thorpe says, one day the warden came to visit him when he had been sent to solitary confinement. "[The warden] said: 'One or two things are going to happen to you. You're going to die of old age in here or a whole group of individuals are going to attack you at one time and kill you. ... You got to make some serious choices with your life. If you tell me what you want to do with your life and it's positive, I'll help you,' " Thorpe remembers. "Next day he came back and said, 'So what do you want to do?' I said, 'I want to go to school.' He said, 'OK, pack your stuff up. You're out of here within the hour.' "
The warden sent Thorpe to school that afternoon. He's been in school ever since. The more Thorpe learned — about himself and others — the more he has felt distance from that 22-year-old killer, he says. But that kind of perspective has a price. Because now when he thinks about his crime, and looks at his students and his family, he's no longer relating to that 22-year-old killer; he relates to his victim. "You know there's times where it's overwhelming and you just don't want to go on no more," Thorpe says suddenly, breaking down crying. He grasps his head in his hands and says it was easier in prison. I think they got it backwards, you know? You want that person to suffer? Let them change. "Not one time did I think about checking out in there," he says. "Out here, I think about it all the time," he says, momentarily unable to finish his sentence. "Because of what I've done." William Leonard's family did not appear at Thorpe's sentencing or parole hearings. NPR's efforts to reach the family were also unsuccessful. In recent months, Thorpe has bought a piece of property in his wife's name and set aside money for their children. He says he's only here at the moment because of them. And that is the irony, Thorpe says, for him and the rest of the men: to change so much that you can finally see the horror of your own self, only to realize you can't live with it. Perhaps, he says, it would be easier for the public, if he didn't change. "Because then they don't have to make those tough decisions," he says. "They don't want to: 'It's look, man, lock 'em up, throw away the key and don't bother me no more. I don't want to think about it. I don't want to have to relive it.' And I understand that." He continues: "But what they really don't realize is when that person changes and comes to fully accept the responsibility and ownership of what they've actually done and feel the weight of that ..."
Thorpe begins to cry again. "[it] far outweighs what they think they're going through in there. I think they got it backwards, you know? You want that person to suffer? Let them change." That's something Hand, when he ran LTOP, understood. He says 30 years ago, his motto with parolees was simple. "Tail 'em, nail 'em and jail 'em," he says. "That was the job. That was your job." But watching these guys in the Long Term Offender Program has changed him too. "It's not about a person," Hand says. "It's about a program. It's about hope. It's about redemption. They're people ... you can't ... I don't think you give up on them." On a recent day Huckleberry, Wells, Mayes and several other LTOP members pile out of a van outside the Sterling Correctional Facility. They've come back to visit with the next group of aging inmates who may one day be released on parole. Correctional officers spot them as the shift changes. "Well, look at you," one calls out to Huckleberry in his suit. Huckleberry beams. They all seem happy unloading their change and glasses and canes onto a counter like men who have never stepped through airport security. But once they make it past the front security post and into the prison, they are all suddenly quiet. A large metal door slams shut behind them, echoing down the long corridor in front of them. Huckleberry seems to speak for all of them. "I hate that sound," he says. On the other side of this prison is another group of men in green jumpsuits pulling plastic chairs into a circle. They are the last of a breed — lifers with parole. The newest lifers that come to this prison will most likely die within these walls. Huckleberry and the men shuffle down the long hallway, walking past their old cells, their canes tapping on the concrete floor.